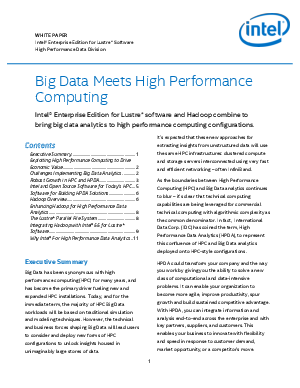 • Compute - The Intel® Xeon processor E7 family provides a leap forward for every discipline that depends on HPC, with industry-leading performance and improved performance per watt. Add Intel® Xeon Phi coprocessors to your clusters and workstations to increase performance for highly parallel applications and code segments. Each coprocessor can add over a teraflop of performance and is compatible with software written for the Intel® Xeon processor E7 family. You don’t need to rewrite code or master new development tools. • Storage - High performance, highly scalable storage solutions with Intel® Enterprise Edition for Lustre* software and Intel® Xeon Processor E7 based storage systems for centralized storage. Reliable and responsive local storage with Intel® Solid State Drives. • Networking - Intel® True Scale Fabric and Networking technologies – Built for HPC to deliver fast message rates and low latency. • Software and Tools: A broad range of software and tools to optimize and parallelize your software and clusters. Further, Intel ® Enterprise Edition for Lustre* software is backed by Intel, the recognized technical support providers for Lustre, and includes 24/7 service level agreement (SLA) coverage.